I'm still not sick of it. It looks so fresh to me--like toothpaste or something. I'm sure it will get old soon enough, like brown and pink eventually did (sort of. I still like some brown and pink). But I'll enjoy it while it lasts. So, J's cupcakes got the aqua and red treatment today. This is more of a minty teal, though, which I've seen Martha doing lately, although I think she's going even greener. The "cherry" on top is actually a gummy raspberry, if you can't tell. Seemed like it'd be less runny. The whole point was to imitate some wooden cupcakes that Bo got for Christmas from her cousins. 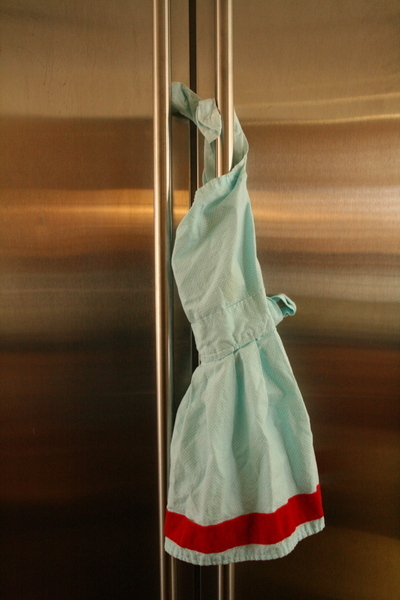 Speaking of Christmas, I thought I'd also post a photo of an aqua and red apron I made for her then. She insists on wearing an apron when she cooks--it's either this one or a red one with a gingerbread man that my sister made her. Oh, and the cupcake stand didn't happen. I bought the supplies but ran out of time. 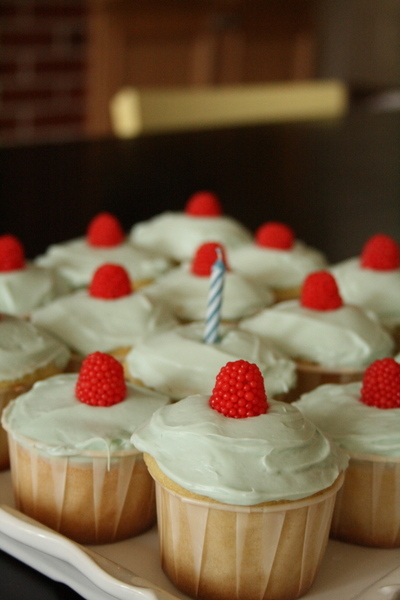 There's always another birthday around the corner ... Heck, who needs a birthday? There's always another reason to eat cupcakes around the corner. 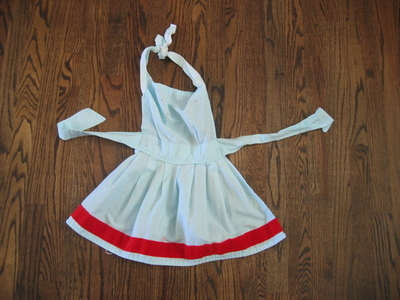 I've been aiming to make matching mother-and-daughter aprons for me and my 3-year-old. I love the style you show here. Is this something you just whipped up off the cuff, or did you follow a pattern? And yes, this means that someone else is reading the blog. Keep up the good work! How exciting ... Penny Carnival's first comment. Thanks, Carolyn. I didn't follow a pattern for the apron. It's basically two rectangles with their seams hemmed--a smaller one that lays vertically and a larger one that lays horizontally. I'll add a photo to the original post to give you a better idea. The fabric for the skirt part was about twice as wide as the end result because of the gathering. Then, I made a sash for the belt and two for the neck. The ones for the neck were sewn on at an angle so the apron has kind of a halter look when it's on my daughter--better coverage for a messy 2 year old. The red trim on the bottom is velvet ribbon. Hope this makes sense. There are plenty of good apron patterns out there. Mary Jane's Farm has some, for one. But it's easy enough to do on your own. Send photos when you get your aprons made! I've seen that Superbowl XLII logo with the aqua and red combination. But I think they don't look good together because the red one on the logo is like maroon to me. Anyway, I still love the aqua and red combination on toothpastes (the swirly type) and, of course, cupcakes.